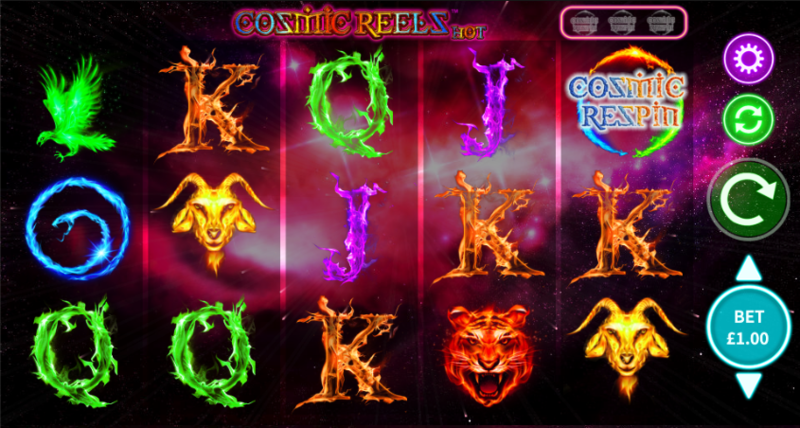 Combine multicolour galaxies and a dash of the fantastic and the result is Cosmic Reels Hot, an online slot from MetaGU; its atmospheric action offers sticky wilds, respins and tempting prizes for the adventurous player. Cosmic Reels Hot is a five reel slot with three rows and just ten fixed paylines; behind those transparent reels we are travelling through space towards a bright pink galaxy as calming music accompanies our gameplay. The four fiery, high value symbols include tigers, monkeys, goats, eagles and snakes while the lower values are represented by J, Q, K and A. The Cosmic Wild icon is of course wild and it appears only on reel three; it will substitute for all other symbols to help form winning combinations except for the Cosmic Respin. The Cosmic Wild is also the key to the main feature explained below. This is triggered whenever the Cosmic Wild symbol appears on reel three and the first thing to happen is that all positions on that reel become wild and stick in place; you’ll receive one free respin with that wild reel held in place but if the Cosmic Respin symbol appears on reel five this process is extended. 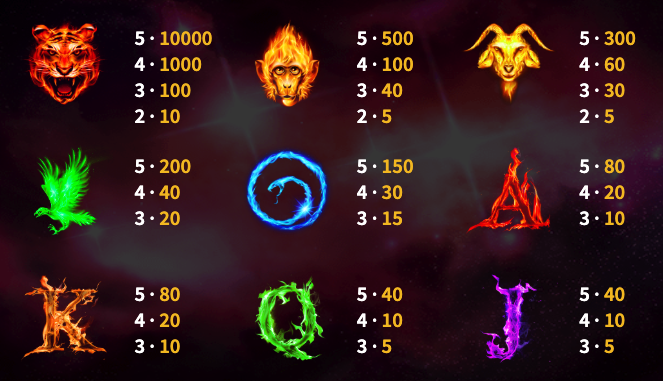 The Cosmic Respin also acts as a wild and sticks in place – ending the round with one, two or three of these symbols in place will award 2x, 10x or 100x the total stake. The little spaces above reel five five light up as the Cosmic Respins are collected. The gameplay in Cosmic Reels Hot may seem simple but the feature is well designed – combine this with the high quality graphics and calming music and this is a slot which rises above the rans.